How Much Lower Can Apple Fall? Apple shares have fallen as much as 17% since their September all-time high. Based on Apple’s humongous gains since 2003 the down side potential is quite large, but here’s one important support level to watch. Did somebody upset the “Apple cart?” Apple’s earnings disappointed and the stock closed lower 6 out of 8 trading days. How much lower can Apple fall? How Low Can Apple Go? AAPL has rallied from $6 – $700 since 2003, so obviously there’s plenty of down side risk. The more appropriate question is: Where’s the next support for AAPL? Below is an updated version of a chart that was first featured on this site on August 22 (Apple Bullies the Nasdaq and S&P 500 But May Soon Disappoint Investors). 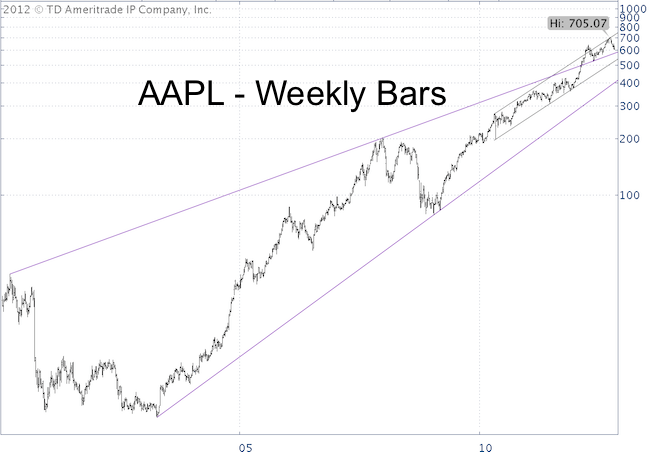 We’re looking at a log scale chart of AAPL prices with two purple trend lines and a black parallel trend channel. The black trend channel contained prices since April 2010 and alerted us of the recent Apple top. AAPL pulled away from trend channel resistance a few weeks ago and is now approaching the upper purple trend line. This trend line coincides with the 200-day SMA at 588 and will be important support. How AAPL reacts to this support may well set the stage for the Nasdaq and S&P 500. The Profit Radar Report looks at all major markets (and some major players like Apple) to identify high probability, low-risk trading opportunities (or upset Apple carts). How Will Hurricane Sandy Affect Stocks and the U.S. Economy? Hurricane Sandy has shut down the New York Stock Exchange. The last time a natural catastrophe forced Wall Street to go into hibernation was Hurricane Gloria in 1985. Even though trading at the NYSE has halted, investors never stop looking for the next opportunity. What sectors will be most affected by this or any other hurricane and are there any profit opportunities? It’s yet to be seen what kind of damage Sandy will cause. According to the National Oceanic and Atmospheric Administration (noaa.gov), Katrina was the most expensive hurricane with damages of $145 billion. Someone has to pay for that damage and insurance companies (that’s what we have insurance for) will end up paying a fair share of the repairs. Property and Casualty Insurance companies collected about $471 billion worth of premium in 2010. According to a report by the Congressional Research Service, done right after hurricane Katrina devastated New Orleans. The net profit earned on the $471 billion worth of premium should be about $40 billion. A common sense approach to investing suggests to stay away from the insurance sector and ETFs like the SPDR S&P Insurance ETF. Of course, the ultimate cost of any disaster will be passed on to policyholders via increased insurance premiums. The New Jersey coast is home to more than six large refineries and has a refining capacity of 1.2 million barrels per day. As of Monday, two thirds of the refineries were shut down. New Jersey refineries account for about 7% of total refining capacity in the U.S. In comparison, the gulf coast accounts for 45% of U.S. refining capacity. The decreased energy demand of the densely populated East Coast caused by hurricane Sandy could be about the same or more than the loss of refining capacity. This means rising oil and gasoline prices nationwide are far from guaranteed. In fact, immediately following hurricane Katrina, oil prices dropped a stunning 21%. Hurricanes are not an automatic buy signal for ETFs like the Energy Select Sector SPDR (XLE), S&P Oil & Gas Exploration & Production SPDR (XOP) and others. Home improvement stores like Home Depot and Lowe’s should attract a big chunk of the disaster prevention and disaster repair dollars spent. The iShares Dow Jones US Home Construction ETF (ITB) has an 8.7% exposure to Home Depot and Lowe’s. Will money spent at Home Depot and Lowe’s cannibalize the holiday spending budget? Retailers like Macy’s, Kohls, Gap, Nordstrom, Tiffany, Amazon, Best Buy – all part of the S&P Retail SPDR ETF (XRT) – could suffer from Sandy. 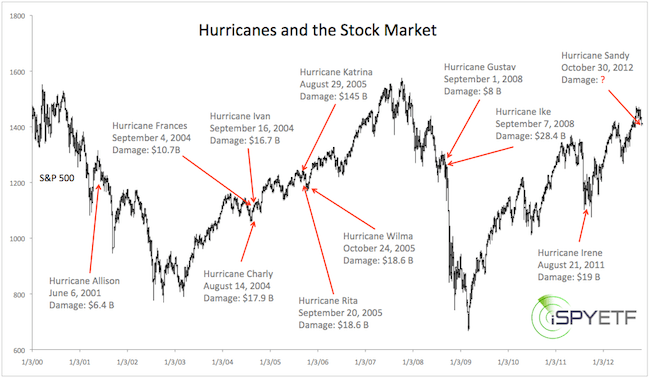 What’s the effect of hurricanes on stocks? The chart below shows all major U.S. hurricanes (since the year 2000) in correlation to the S&P 500 Index. Allison in June 2000 came amidst the tech bubble deflation. Charly, Frances, Ivan, Katrina, Rita, and Wilma didn’t make a dent in the 2002 – 2007 market rally. Gustav and Ike happened right before the financial sector unraveled in 2008 and Irene landed on shore at a time when we expected a major market bottom. The August – October timeframe happens to be a tumultuous one for nature and stocks and recent hurricanes coincided with stock market inflection points. This could be the case again with Sandy. Last week’s Profit Radar Report pointed out that the S&P 500, Dow Jones Industrials, MidCap 400 Index, and Russell 2000 are all above key technical support. Like a stretched rubber band they should snap back, but if the don’t they’ll break. As such, the next opportunity will likely be triggered by technical developments not hurricane Sandy. The Profit Radar Report will provide continuous updates and trigger levels for the “stretched rubber band” condition. The S&P 500 Index is generally sub-divided into nine sectors. How the leading (or lagging) sectors behave can provide valuable forecasting insight. This article takes a look at the three leading year-to-date performers and their technical message. 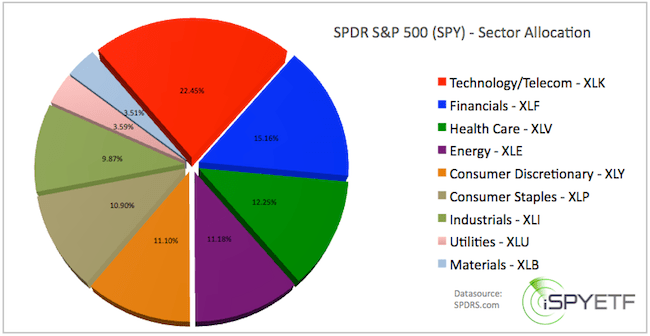 The S&P 500 Index and the SPDR S&P 500 ETF (SPY) are made up of ten industry sectors. State Street Global Advisors subdivides the S&P into nine popular sector ETFs, called Select Sector SPDRs. There are ten sectors, but they are condensed into nine ETFs as the technology and telecommunication sector are represented by the same ETF, XLK. The first graph below provides a visual of the S&P 500 sectors and the sector allocation for the Select Sector SPDRs. The second graph shows the year-to-date performance of each sector. Each sector corresponds differently to economic developments and some sectors may boom while others bust. That at least used to be the case. During the 2000 decline about half of the sectors delivered positive returns, the remaining ones negative returns. Since the beginning of the QE market, most sectors are up, just at a different pace. 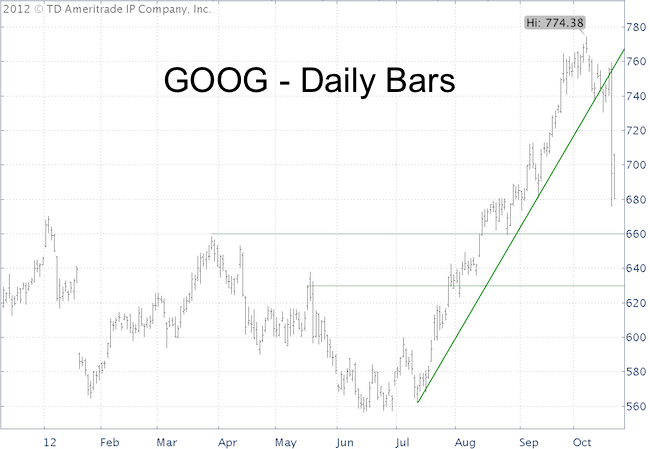 Right now, most sectors are just above technical support and are sending the same technical message: Watch out how each sector performs around support. If support fails … watch out. The technology sector got hit hard in recent weeks. 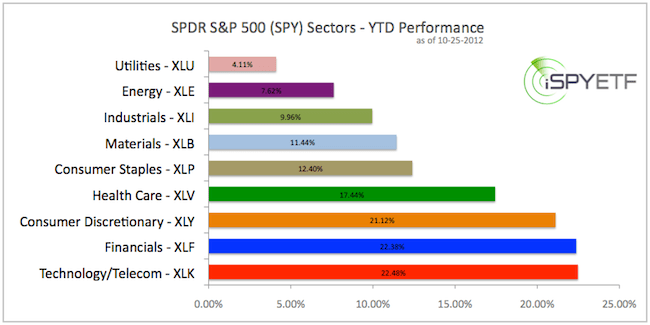 Nevertheless, as of Thursday’s close the Technology Select Sector SPDR (XLK) is up 22.48% year-to-date. The technical picture for XLK looks plain ugly. 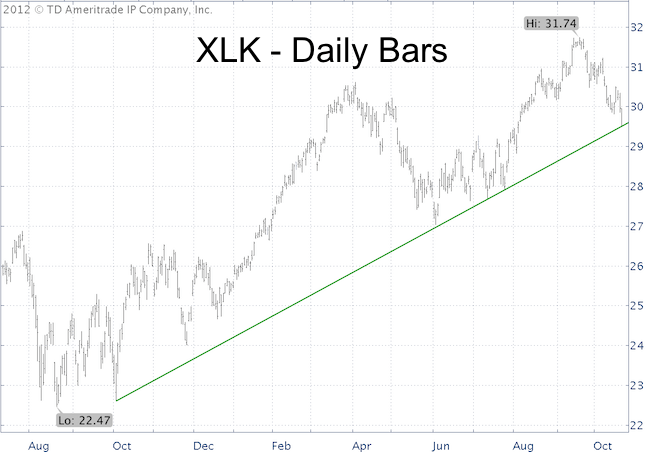 XLK dropped through trend line support going back to the October 2011 lows (at 29.65) and the 200-day SMA at 29.19. The technical picture for the Nasdaq-100 looks similar. December 30, 2011 was the last time the Nasdaq-100 closed below the 200-day SMA. It’s been trading above the 200-day SMA for more than 200. Here’s a surprising factoid: Since 1990 the Nasdaq-100 had seven streaks of trading above the 200-day SMA for more than 200 days. The first close below the 200-day SMA was bearish only one time. Owners of Rydex funds have grown very skeptical of the technology sector. The percentage of assets invested into Rydex technology funds has dropped to an all time low. The Financial Select Sector SPDR ETF (XLF) rallied as much as 10% after it broke above 14.90. Even though the technical picture of the technology sector looks quite bearish, there’s reason to believe that the down side is limited. A bullish opportunity may develop soon. The financial sector, represented by the Financial Select Sector SPDR (XLF), is holding up much better than the overall market. The chart for XLF is a bit more decorated with trend lines as the Profit Radar Report has provided updates for XLF since it’s August 6 break out. Immediate trend line support for XLF is at 15.65. The 50-day SMA is at 15.68. Immediate resistance is at 16.05. Aside from a break of the minor red trend line support, the recent decline hasn’t done any technical damage to the financial sector. 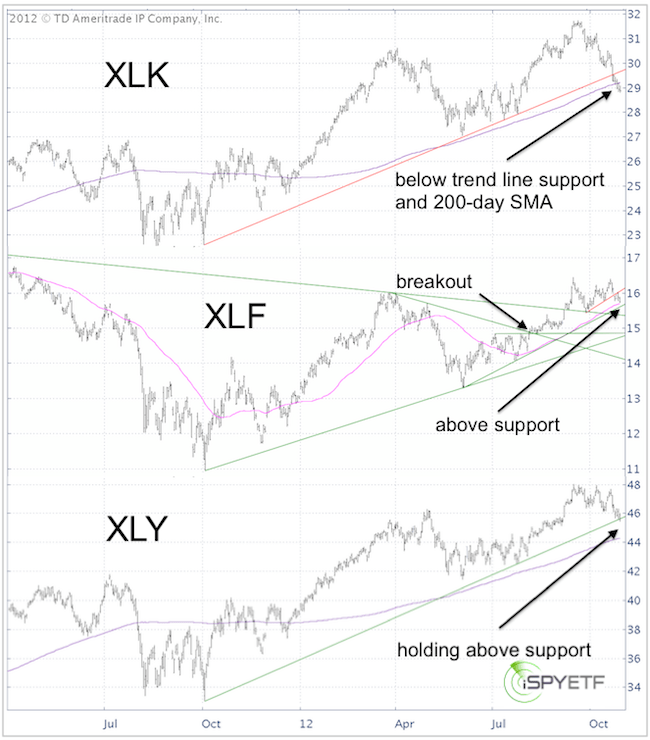 The Health Care (XLV) and Energy Select Sector SPDR (XLE) are slightly bigger than the Consumer Discretionary SPDR (XLY), but XLY outperformed XLV and XLE. XLY is just barely holding on to its position above the trend line from the October 2011 low (at 45.60), but the 200-day SMA is not until 44.27. Support based on prior supply/demand inflection points is around 45. News Flash: Is Bernanke Going to Throw in the Towel? Abstract: Former president George W. Bush first appointed Ben Bernanke to run the U.S. central bank on February 1, 2006. President Obama confirmed a second term on January 28, 2010. But latest news suggests that Bernanke is done. The New York Times reports that Federal Reserve Chairman Ben Bernanke has told close friends he probably will not stand for a third term. Mitt Romney has made no secret that he would not re-nominate Bernanke if he wins the presidency, but it’s news that Bernanke told friends he wouldn’t go for a third term even if president Obama gets re-elected. Bernanke’s term as chairman ends in January 2014. Treasury Secretary Timothy Geithner already stated that he wants to leave by the end of the year. Why would Bernanke and Geithner want to leave their prestigious jobs? Here’s my opinion: Bernanke and Geithner are the center of the financial world. They know exactly what’s going on and what the Federal Reserve can and cannot do. They know how many skeletons banks (corresponding ETF: SPDR S&P Bank ETF – KBE) and financial institutions (corresponding ETF: Financial Select Sector SPDR – XLF) have in their closets. They know how good or bad the shape of the European financial system is in and realize the implications of the growing U.S. deficit. The U.S. economy has hit an iceberg. The Federal Reserve’s “pumps are pumping as hard as they can,” but the ship is still taking in too much water. It’s just a matter of time for the inevitable to occur. Who wants to be the captain of a sinking ship? But does leaving a ship – damaged but afloat – relieve the captain of his accountability? Perhaps we should ask Alan Greenspan. Here’s a surprise: Wall Street forecasts haven’t been optimistic enough to keep up with stock prices. That’s right, the S&P would actually have to drop about 5% to “catch up” with analysts’ target prices. This sounds bullish, but it’s not. If you’ve read my articles before you know that I like to poke fun at Wall Street analysts and use them as a contrarian indicator for stock market analysis. Most of the time that’s pretty easy, because they are wrong more often than right. Wall Street is always way to optimistic, but something changed a couple of years ago (we all know what changed, more about that later). Surprisingly the one-trick pony rosy forecasts have been pretty spot on. Despite three serious correction since 2009, stocks eventually recovered to reach and surpass analyst estimates. According to Bloomberg data, the average year-end price target for the S&P 500 is currently around 1,400, about 2% below current prices (a few days ago it was 5% below). Stocks will actually have to drop to get in line with analysts forecasts, that’s rare. One would think that’s bullish from a contrarian point of view, but it isn’t. Lets look at prior examples when analyst forecasts weren’t bullish enough to keep up with the stock market. Analysts’ forecasts also trailed stocks before the 2000 and 2007 market top, in late 2009, late 2010 and early 2012. Each prior instance occurred before a sizeable top. The S&P 500 didn’t decline immediately, but several months later any gains were given back every single time it happened (going back 13 years). Goldman Sachs’ chief US equity strategist, David Kostin, sees the S&P 500 at 1,575 by next year. Oppenheimer’s John Stoltzfus sees 1,585, Bank of America’s Savita Subramanian sees 1,600 and Citigroup’s Tobias Levkovich expects 1,615. The numbers seem somewhat arbitrary to me, but the common denominator of 15 predictions tracked by Bloomberg is the expectatian of new all-time highs. Is that too much groupthink? It just might be. In February 2009, a similar cohort of analysts rapidly ratcheted down their end of year price targets and earnings expectations. Stocks bottomed in March and haven’t looked back since. From blunder to crystal ball, what change made one-trick pony Wall Street analysts look like geniuses? The non-scientific but accurate reason is QE and other liquidity shenanigans facilitated by the Federal Reserve and ECB. Forecasting a Fed supported market has proven to be like forecasting weather in a green house. Always warm, always dry, and mostly sunny. Ironically history suggests that periods of accurate or too low analyst predictions tend to lead to some sort of top. Poor analysts, they just can’t earn credibility. Fortunately for them Wall Street bonuses are the highest they’ve been in years. Due to some sentiment extremes and technical break outs and a break down we saw some contrarian low-risk trading opportunities for the S&P 500, gold and China. The associated ETFs are the SPDR S&P 500 (SPY), SPDR Gold Shares (GLD) and iShares FTSE China 25 Index ETF (FXI). This video highlights trading opportunities for the S&P 500 (SPY), SPDR Gold Shares (GLD) and iShares FTSE China 25 ETF (FXI). Additionally it reveals a simple but unknown strategy on how to deal with fake out break outs (or seesaw moves). Continuous updates are provided via the Profit Radar Report.